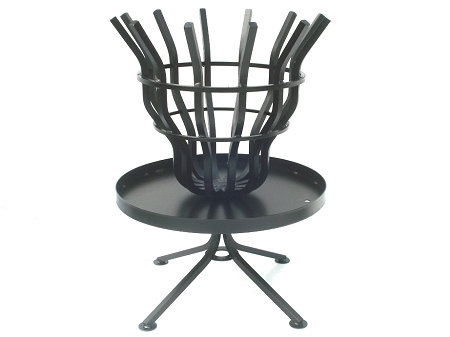 Fire pit stands 32½" tall. Basket and legs are constructed of ¾" solid steel bar. Ash pan is 24" in diameter and made from heavy &frac18;" steel. The protective ash pan makes this fire pit perfect for burning on lawns! Disassembles without tools for storage. Assembled unit weighs about 90 lbs. Ships in two boxes. I purchased your tall Outdoor Fire Pit last week. I had been looking at many different firepits on line an in the big box stores. Wow it worked so well. The heat that was generated from just a medium size fire in this unit was excellant. I would highly recommend this unit for any homeowner or church group etc. The free shipping was unexpected an was an added bonus. I look forward to using this for many years to come. We have had this work of art for 4 years or so and love it! The self feeding aspect is great and it shows no sign of wearing out. Probably the best fire pit on the planet. This is a quality product and well worth the money. I have only had it for a few weeks (in Winter) and have had two fires. I placed this in a deep stone firepit we had made in a backyard reconstruction project. I was worried at the time that the fire would sit in the pit and the warmth would be absorbed by the stone walls. I was right. 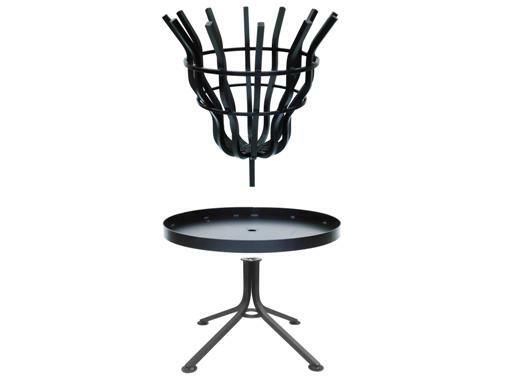 This product changed that as it raised the fire above the top of the pit so all can enjoy its warmth and looks. Was easy to assemble. It is heavy, which is good, so consider two to install in a pit. And it can be used as a stand-alone pit. The verticality of the pit makes lighting easy. Best to use smaller blocks of wood rather than big logs but with enough kindling anything will burn in it. Very satisfied. The day before it arrived we went on a burn ban so this is based on looks. On my 200 acres this is my favorite accessory based on looks alone. It is absolutely beautiful. I have it setup on the “island” that our circle driveway creates. Everyone who has seen it wants to see it in action. Can’t wait to burn after the next rain. The Tall Fire Pit is an Awesome complement to to my M series Vertical fireplace grate wall of fire in our patio semi-outdoor fireplace, when it is cold and there are too many folks and all can't get around the fireplace close enough to feel any heat. Both the grate and pit are awesome, heat more than their competitors, and are self-feeding, requiring little or no "stoking" - Love them and brag to every one that I can - many have already ordered and all love them too - no complaints by me or anyone else. This is the BEST fire pit we could have bought. We are so pleased with the quality. We love the heat that it produces, along with the light that it gives off. It’s such a neat idea. Shipping was fast.